www.downloadslide.com 388 Part Four Organizational Processes Elements of Organizational Culture 14-1 Organizational culture consists of shared values and assumptions. Exhibit 14.1 illustrates how these shared values and assumptions relate to each other and are associated with artifacts, which are discussed in the next section of this chapter. 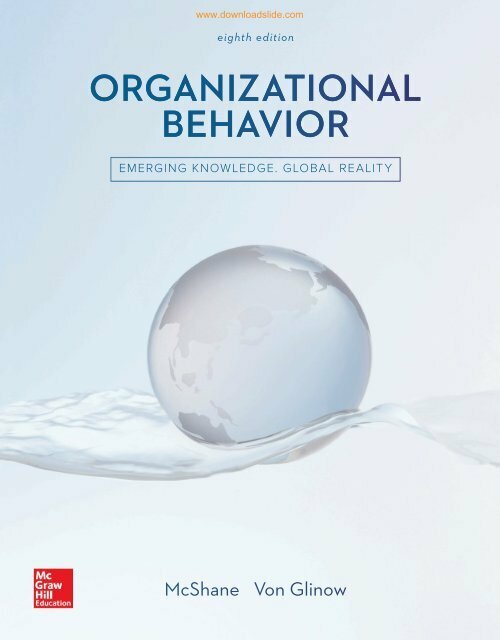 Values are stable, evaluative beliefs that guide our preferences for outcomes or courses of action in a variety of situations (see Chapters 1 and 2). 3 They are conscious perceptions about what is good or bad, right or wrong. In the context of organizational culture, values are discussed as shared values, which are values that people within the organization or work unit have in common and place near the top of their hierarchy of values. 4 For example, Alibaba’s 17 cofounders identified six shared values that define the company’s culture: customer first, teamwork, embrace change, integrity, passion, and commitment. Organizational culture also consists of shared assumptions—a deeper element that some experts believe is the essence of corporate culture. Shared assumptions are nonconscious, taken-for-granted perceptions or ideal prototypes of behavior that are considered EXHIBIT 14.1 Organizational Culture Assumptions, Values, and Artifacts Artifacts of organizational culture Physical structures Language Rituals and ceremonies Stories and legends Shared values • Conscious beliefs. • Evaluate what is good or bad, right or wrong. Organizational culture Shared assumptions • Nonconscious, taken-forgranted beliefs. • Implicit mental models, ideal protoypes of behavior.